Each Game of Thrones episode generates its fair share of internet chatter. This new Twitter #interactive visualization takes this tremendous amount of information and translates it into something surprisingly meaningful. At first blush, this data visualization looks a bit intimidating, but it’s actually pretty straightforward. The first step is to pick an episode among the six seasons available. Here, we’ve chosen “The Watchers on the Wall” from season four. Each circle represents a character, and the size depends on how often the character was mentioned in tweets, and the color represents that person’s (or institution’s) affiliation. On the left side you can see the Twitter mentions broken down into a percentage, along with the most popular emojis used to describe each character. 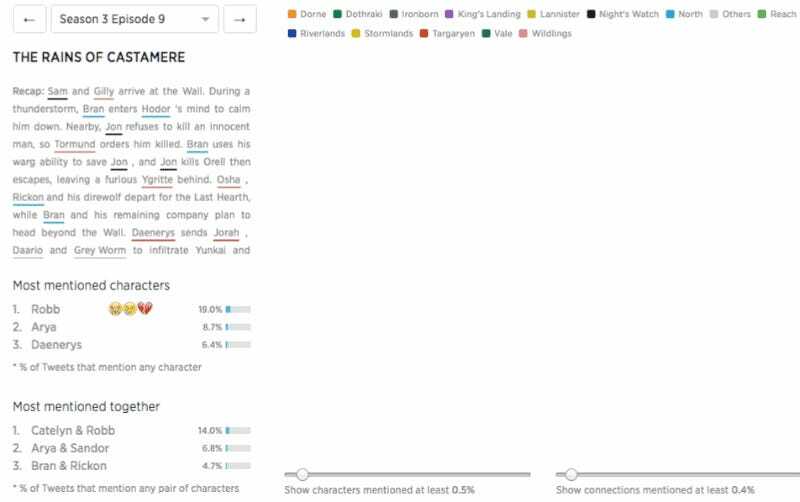 Tweets containing keywords relating to Game of Thrones were measured from each episode’s air time to 24 hours afterwards. In this particular episode, Jon Snow was mentioned in 33.2 percent of tweets, followed by Ygritte (15 percent), and the Night’s Watch (10 percent). For obvious reasons, the crying, tears, and heartbreak emojis were used most frequently in association with these characters. The lines that connect each character represent each time two characters are mentioned in the same tweet. The thicker the line, the more these two characters were mentioned together. The thickest line in this episode is between Jon and Ygritte, who were mentioned together in a whopping 40 percent of all tweets. Other strong associations can be seen between Jon and the Night’s Watch (11.2 percent), and Gilly and Samwell (6 percent). For comparison, here’s what the “Rains of Castamere” episode looks like, otherwise knows as the “Red Wedding” episode from season three. When you hover over a character, you’ll see batch of useful information. You can even drag the circles around to make the orientation more meaningful to you. The circles are also clustered together (here in shades of grey, orange and blue), which signifies story lines. Lastly, there’s a useful scale at the bottom where you can show characters and connections based upon a percentage strength of your choosing.